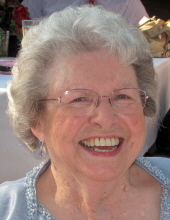 Evelyn Byrd Rosebrock, of Oak Park, Illinois, passed away on January 15 at the age of 95. Born in Claremore, Oklahoma, she lived in over 20 coast-to-coast locations by the time she reached age 20, later settling into long-term residences in Indianapolis, where she and her husband of 54 years, Theodore L. (Ted) Rosebrock, raised their four children, then in Rochester, Michigan, and in retirement in Perry, Georgia. She spent her final 11 years in Illinois. The top student in her 1946 Butler University College of Pharmacy class, Mrs. Rosebrock joined other World War II-era women in breaking gender barriers in professions previously associated with males only. She practiced pharmacy in both Indiana and Michigan. Her sharp intelligence and deft organizational and social skills were also evident in her volunteer work, as she held leadership posts in organizations such as Speedway (IN) Christian Church, the Alpha Delta Omega national philanthropic sorority, the Speedway Eastern Star, the Rochester (MI) Newcomers Club, the Perry (GA) Presbyterian Church, and the Brookdale/Holley Court of Oak Park (IL) Residents’ Board. She was named Rochester Woman of the Year just two years after moving to Michigan and became a lead docent at Rochester’s Meadowbrook Hall mansion. She was an accomplished and avid bridge player and lover of board and card games, puzzles, and party games that expanded and exercised the mind. Artistically adept and unafraid of any challenge, she could sew clothes and costumes like an expert tailor, create beautiful crafts and home décor, and fix broken plumbing and small appliances when the situation called for it. Her travels took her to all 50 states, most often by car with a camping trailer in tow, as well as to dozens of international destinations. Mrs. Rosebrock is survived by her daughters, Jere Rosebrock (Steve Groth) of Zionsville, Indiana and Jana O’Brien (Wayne Parman) of Oak Park, Illinois, her daughter-in-law Mary Rosebrock of Valencia, California, seven grandchildren and two step-grandchildren, and seven great-grandchildren. She was preceded in death by her husband in 2000 and by her two sons, Dr. Steven Rosebrock and Douglas Rosebrock, both in 2005. Visitation will be held on Thursday, January 17 from 3-8 p.m. at Drechsler, Brown & Williams Funeral Home, 203 S. Marion Street, in Oak Park. A memorial service will be held at St. Pauls UCC, 2335 N. Orchard Street, Chicago on January 26 at 10 a.m. In lieu of flowers, please donate to St. Pauls Church or an organization of your choice that promotes goodness and mercy, two of Evelyn's core attributes. To send flowers or a remembrance gift to the family of Evelyn Byrd Rosebrock, please visit our Tribute Store. "Email Address" would like to share the life celebration of Evelyn Byrd Rosebrock. Click on the "link" to go to share a favorite memory or leave a condolence message for the family.